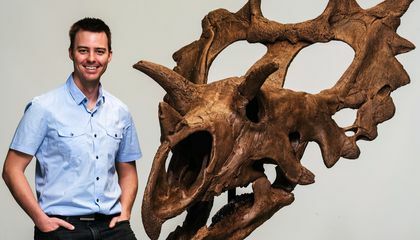 A novice fossil collector's lucky find in a remote Montana badlands more than a decade ago has turned out to be a new kind of spectacularly horned dinosaur, researchers have announced. The bones were unearthed near Winifred, Montana. They represent a previously unknown species of dinosaur that lived 76 million years ago. Its scientific name is Spiclypeus shipporum (spi-CLIP-ee-us ship-OR-um) but it's been nicknamed "Judith." The name was taken from the Judith River rock formation. That is where it was found in 2005 by retired nuclear physicist Bill Shipp. Canadian Museum of Nature paleontologist Jordan Mallon says Judith is closely related to the well-known Triceratops. Both had horned faces and elaborate head frills. Judith's horns stick out sideway instead of over the eyes. After recovering six bones during an initial dig, Shipp brought in a team the next summer. The team spent two years excavating and cleaning the bones. An examination of its bones was done by Edward Iuliano. He is a radiologist at Kadlec Regional Medical Center in Richland, Washington. The exam revealed evidence of a severe leg infection that would have left the animal hobbled. The injury made Judith potentially vulnerable to Tyrannosaurus rex-like predators that lived around the same period, Mallon said. "It's an exciting story, because it's a new species. And yet we have this sort of pathetic individual that suffered throughout its lifetime," Mallon said. "If you're hobbling along on three limbs, you're probably not going to be able to keep up with the herd." A public exhibit featuring a reconstruction of Judith's skull and other bones from the find on Bill Shipp's ranch opens May 24. It will be at the Canadian Museum of Nature in Ottawa. 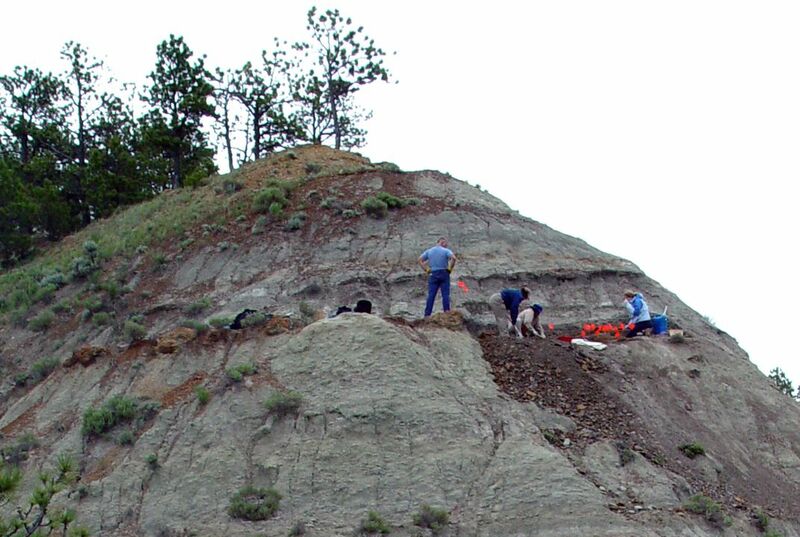 Fewer than a dozen dinosaur species have been discovered in the Judith formation. This is despite more than a century of exploration in the area, said John Scannella. He is manager of paleontology collections at the Museum of the Rockies in Bozeman, Montana. It is unusual for an ameatuer fossil hunter to find a dinosaur because finding bones of animals that lived 76 million years ago, as anyone would assume, is relatively hard. The bones could be miles underground, under thick layers of rock and soil that have been caked on over the centuries. It would take years to find even the smallest of bones. The discoverer of Spiclypeus shipporum, for example , " 'found it accidentally on purpose,' Shipp said. 'I was actually looking for dinosaur bones, but with no expectation of actually finding any.' "
It is unusual for a first-time fossil hunter to find a fossil because the first timer may not know what to look for or where to look where a fossil hunter with greater experience would know where and what to look for. I think this article is pretty cool because I think dinosaurs are really interesting and especially finding a new species at this time which is rare. This finding of a new species gives us hope for finding more dinosaurs and adding more pieces to this never ending puzzle. This article really interested me and I am happy to hear more species are still being discovered. It is unusual for a first-time fossil hunter to find a dinosaur because most of the time they are just looking for bones, not a dinosaur. "I was actually looking for dinosaur bones, but with no expectation of actually finding any." I enjoyed this article because I found it interesting that they found a dinosaur in Montanan. it's unusual for a first-time fossil hunter to find a dinosaur because he/she is not well trained as those that have been doing this for years.and you've only done it for a couple of days.My opinion on this topic is that there is a new species of dinosaur and we've found it but sadly this dinosaur died at maybe 10 years of age so sad. The only support to this question is that a new fossil hunter is inexperienced. I don't think that there is a great chance that an experienced hunter will find a dinosaur, compared to a newer hunter. An additional argument is that the new hunter could bring new and unprecedented ideas to the table. A fine article however a controversial question. It is unusual for a first time fossil hunter to find a dinosaur because it is very rare for major discoveries to be made without years of research. It is unusual for a first-time fossil hunter to find a dinosaur because they have little experience so they don't know how and where to look for fossils. In the text it says "He had hired an amateur paleontologist to give him an introduction to fossil hunting on a ranch Shipp owned near the Upper Missouri River Breaks National Monument." I thought this article was interesting because it seems to be very hard to find fossils, and to find them your first time is really cool. It was unusual for a first time fossil hunter to find a fossil because there are people who spend their whole life trying to find a fossil. I found it surprising that a first time hunter found a fossil. I found it interesting that an average person can find a new dinosaur. It is so unusual for a first-time fossil hunter to find a dinosaur because it is so rare, and you have to get really lucky. Shipp even said "I was actually looking for dinosaur bones, but with no expectation of actually finding any." I thought this article was interesting because it shows how much there is that we still haven't discovered. It is unusual for a first-time fossil hunter to find a dinosaur because they are new to it. They are also not even looking for an entire dinosaur because of how difficult that can be. "I found it accidentally on purpose, Shipp said." This is interesting because of how hard this is to find.